On an October visit to OM in Montenegro, OM writer Nicky Andrews visited the location of the 2018 Beach Club to hear how, as the seasons change, the local team still shares God's love. Mention the summer Beach Club to OMer Robbie in Montenegro and you are sure of an excited response. “Every year I am so amazed at the programme and how God brings these kids who are on vacation with their families!” he enthuses. Every summer since 2008, OM has run a children’s programme for two weeks on the beach in Bar, a major port and seaside resort in southern Montenegro. Kids come for a high-energy mix of music, games, puppets, crafts and Bible stories. OM Montenegro staff the camp with assistance from international volunteers; this year two volunteers came from Germany, and one from Jamaica. This year the team gave out 80 Bibles to kids and families from Orthodox, Muslim and Catholic backgrounds as well as those with no religious affiliation. The team prayed that, as families returned home after their holidays, the Bibles would not be forgotten, but would be treasured as a special memory of the Beach Club and studied with hearts open to receive God’s truth. The team prayed, too, for God’s blessing on the owners of the beach-front cafes, without whose practical assistance, the Beach Clubs could not take place. Robbie and his OM colleagues take seriously the idea that they can be the ‘fragrance of Jesus’ to these business people, not just in August for the duration of the Beach Club, but all year round. “Come down to the café and meet us for our team Bible study,” was an invitation I couldn’t refuse during my visit in October, and a great reason for a morning walk along the Adriatic coast. Fresh breezes and lively waves buffeted the beach-front promenade while higher up the sands, a few intrepid sunbathers were catching the year’s final warmth. As I strolled with my husband along the promenade, there were fewer stalls and bars the further away we got from the town centre, and tall, spreading native pines took the place of tidy palm trees. Half a mile on, we reached our destination–one of the few sea-front cafes still open for business at this time of year, a bright fresh contemporary place. Sitting down at a table with Robbie, his wife, Angela, and their colleagues Igor and Santa, we were joined by some other visitors–ShinGu from Korea who served in Montenegro with OM eight years ago and his wife, SuHee, who are here on holiday. Soon we were sipping coffee and discussing the Gospel of John, while inwardly praying for the café staff and customers around us. The team come here every week for an hour or two of Bible study, a consistency of witness and friendship, which are very important in this relational Balkan culture. When we all got up to leave, we took turns huggin each other goodbye, and I saw the heads of nearby customers turn to watch. May the Lord open the hearts of these onlookers and be preparing this place for Beach Club 2019! 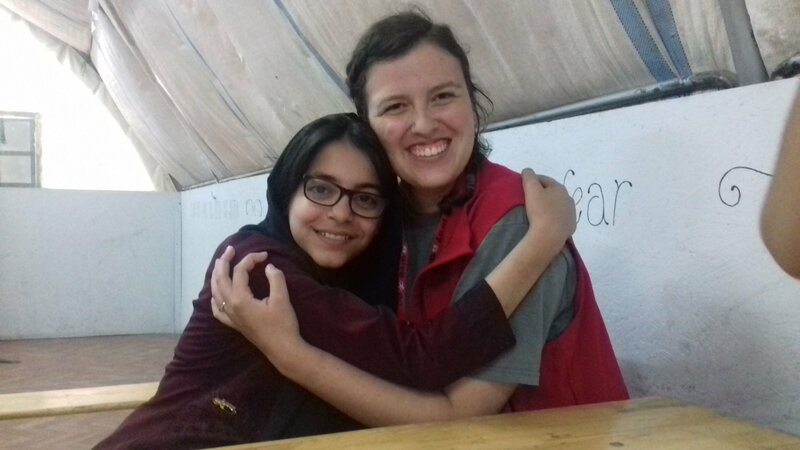 Student Amy from the USA used her summer vacation to serve with OM in Montenegro and Serbia, sharing God's love with the young and old. After making friends at OM's English Cafe, Igor shares with them how he came from a similar background but was freed from despair when he met Jesus.